I’ve been reading for as long as I remember. My mother tells me I started when I was two which I’ll have to take her word for as my memory is vague when I attempt to push it that far back. I do know there has hardly been a time in my life when I haven’t had a book of some sort with me and one of the joys of adult life is being able to build my personal library. Only the ones I know I’ll read again earn a permanent spot on my shelves and I have books that have been my favorites for decades along side new favorites. I find it interesting to see how my taste in reading has changed throughout the years but then I look at my shelves and wonder if it has, really. One of my favorite stories is The Black Arrow by Robert Louis Stevenson. I can’t remember how young I was when I first read it but the adventure and romance captured my imagination then and continues to do so now. I think I understand more of it as an adult than I did as a child. All I saw was adventure and romance then, I see politics and racism now-but still adventure and romance. A Wrinkle in Time is one of my favorites. Over twenty years have passed since I first read it and I can still pick it up and become immersed in what is marketed as a children’s book. Island of the Blue Dolphins is the same. I was ten or eleven when I first read it and was amazed at Karana. I wondered if I would be able to survive the way she had and was fairly certain I would not. There are still times I pick up this book and spend an hour marveling at Karana’s strength and mourning her loss. Mary O’Hara’s books have stayed on my shelves for decades as well. My shelves also have books I would never have considered reading when I was younger. I liked fiction. The worlds I read about were real to me so why did I need non-fiction. Thank God that, as an adult, I have found joy in non-fiction. Think of all I would have missed, like the history books written by Philip Matyszak. His books make me laugh until my face hurts. Oddly, Herodotus’ Histories also make me laugh, something I did not expect. I swear I can hear the tone of his writing change when he begins making stuff up. He fascinates me because I read that he was an oddity for choosing to travel so far from his home. I like oddities, being one myself, and I’d like to know more about Herodotus. Unfortunately-or fortunately, depending on your view-Herodotus disappears inside his Histories and I found very little of his character revealed in his writing. I read Thucydides because I read somewhere he scorned Herodotus’ Histories and wanted to write a pure history of the Peloponnesian War. Just the facts, ma’am. 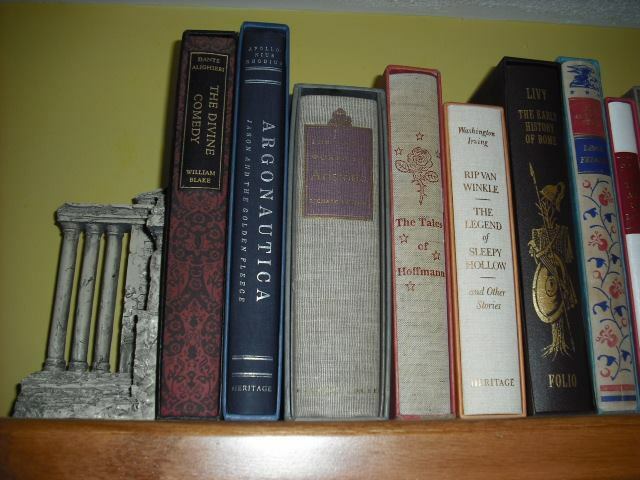 Thucydides sits on my shelf between Tacitus and Xenophon: my shelves are sorted both by genre and then alphabetical. One of my joys is to reconsider my current sorting method and decide whether or not there’s a better one. Should my classic literature be separate from my modern literature? Does Mark Twain qualify as literature or should he be moved to my Children’s books section? I may need to get out more. Anywho…when I’ve had my fill of history I turn to a Georgette Heyer romance or a Jacqueline Girdner mystery. Or Jack London. Or Mark Twain. Or Robert Louis Stevenson. Or Lois McMaster Bujold. Or Wilkie Collins. Or Jane Austen. You’ll find all of them on my shelves along with so many others. As my collection has expanded, it has caused me to indulge in some deep introspection. All of these books must be dusted, cared for, and read. Which means, what do I really want to keep hold of? Am I keeping books because they make me look smart when I have no interest in reading them ever again? That answer was yes. I’d read Gone With the Wind in the third grade sure I was going to be exposed to a great romance. Perhaps I was but I remember I liked Walter Farley and Anna Sewell much better. I read it again as an adult and still preferred Walter Farley and Anna Sewell. Gone With the Wind was traded for something I’ll treasure. I had to admit I don’t care for Dickens. I felt like I could tell he was paid by the word. Not that I dislike his writing: I enjoyed his foray into banking in A Tale of Two Cities and could picture a young man being kept in a basement until he was old. My problem? I’d almost forgotten the plot by the time Dickens wended his way back to it. I much prefer Wilkie Collins. I dragged The Moonstone everywhere with me until I’d finished it. It took me a full two days and I don’t think I was of much use to anyone until I closed the covers for the last time but it was worth it. The Woman in White and No Name quickly found space on my shelves. I’ve tried twice to read Anna Karenina and never finished it. I had a co-worker urge me to try again and it’s on my list: perhaps the third time will be a charm. However, I devoured Ivan Turgenev’s Fathers and Sons in one sitting. I haven’t purchased it as I don’t know I’d read it again but I remember how the words flowed so smoothly the rhythm of my read was never interrupted. Not a happy story but not sad either. It intrigued me. So why the introspection now? I recently reached a point where I could not purchase another book unless I started stacking them on the floor or acquired another bookshelf. I had to take another hard look at what I was keeping and ask myself, are you really going to read these again? I found a few where that answer was no. I find I prefer reading Plutarch, Julius Caesar, Cicero, and Marcus Aurelius rather than fiction about Rome (unless it’s an incredible story) so a few of those could go. Akhenaten fascinates me and I found myself annoyed with a fictional account of his and Nefertiti’s building of Amarna so that went in the trade box. A ruthless and honest look at my taste in books made me pull The Works of H.G. Wells. This consisted of his lesser known writings: excellent writing but the stories are a tad depressing. Into the box it went.